"...Simultaneously lush, voluptuous and uncompromising...he’s the alternative blues version of Robert Palmer: organic yet sophisticated...Imagine Jack White merging his talents with those of Robert Palmer and you’ll have an idea of just how good Dave Cavalier’s Howl is." "...combining a musical beauty and individual sense of arrangement with powerful and emotive lyricism...that is truly undeniable in every sense of the word." "Filled with luscious contradictions...You can't help but love him and his music, they are one in the same." "Deemed “LA Blues”... Cavalier has created a niche in a landscape of disposable music & entertainment that is decidedly individual. His playing style has been compared to modern day bluesman, Gary Clark Jr, and even guitar icon, Jimi Hendrix, creating an emotionally raw and visceral live atmosphere for audiences with an undercurrent that is seductive & stylish." "I can’t figure out what this song reminds me of, but I can tell you it’s a hot scene in a place you want to be. There’s an energy here that is equal parts Elvis and someone far more recent (maybe Justin Timberlake?). Stylistically it blends the 60s and 70s I suppose, but it has a freshness that’s sure to get people up out of their seats to that dancefloor." "Dave Cavalier's unique style of "LA Blues" combines the raucous authenticity of modern bluesman such as Gary Clark Jr. with the contemporary, alternative arena rock sound of artists such as Kings of Leon, all with the stylish, sophisticated imaging of a John Varvatos ad. The ceiling for this project is high so climb aboard for the ride." 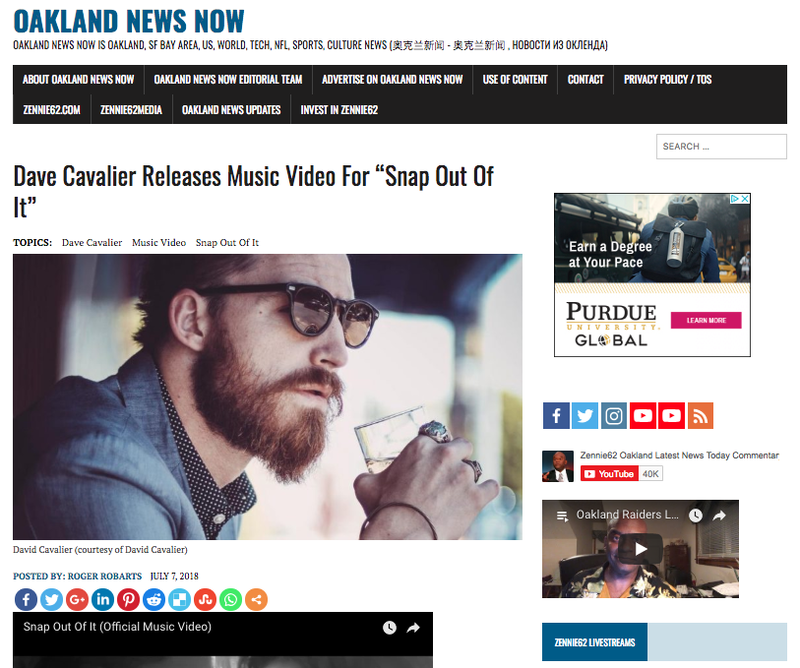 "Dave Cavalier Trio is an unapologetic blend of blues-based modern alternative rock bringing the soul of Chicago and the grit of Hollywood together in poetic mastery." "Dave Cavalier's music captivates the listener, with driving and powerful guitar riffs...but in all this fun and exhilarating chaos, his smart and melodic choruses thrust each song to another level." "...Alt-blues singer-songwriter, Dave Cavalier, has masterfully created music throughout his acclaimed career..."
"A modern day bluesman and one hell of a live performer, pairing a raw energetic talent with an easy going personality that is stylish & fearless."